The photo on the left is of Dario Cecchni. 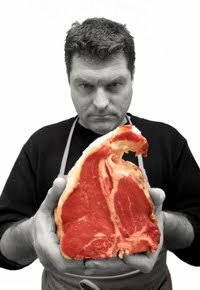 Dario Cecchini inherited his family’s 250 year-old butcher shop in Panzano, Italy 30 years ago and has turned a small shop into a mecca for foodies, built a brand which is now recognized internationally, extended the business into other areas, with restaurants and branded packaged products, and become a star of the international media and in the restaurant world. The full story in the Other section below.